A third of people treated for cancer develop adverse side effects within their mouth. But while these effects can be devastating to teeth and gums, there are ways to minimize the damage. Treatments like chemotherapy and radiation work by destroying cancer cells. Unfortunately, they may also destroy normal cells. The accumulation of this “collateral damage” ultimately affects uninvolved areas and organ systems of the body. 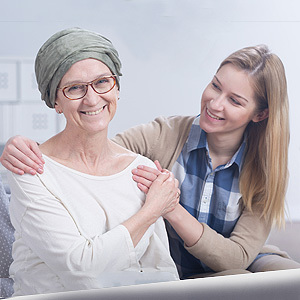 Chemotherapy, for example, can interrupt bone marrow blood cell formation and decrease the body's ability to fight infection. These ripple effects can eventually reach the mouth. It's not uncommon for cancer patients to develop mouth sores or see an increase in tooth decay or periodontal (gum) disease. The treatments may also inhibit saliva flow: because saliva neutralizes acid and provides other benefits that lower disease risk, dental disease is more likely to develop when the salivary flow is reduced. The first step to minimizing these effects is to improve oral health before cancer treatment begins. An unhealthy mouth vastly increases the chances for problems during treatment. Cooperating with your cancer physicians, we should attempt to treat any diseases present as soon as possible. During cancer treatment we should also monitor your oral health and intervene when appropriate. If at all possible, you should continue regular dental visits for cleaning and checkups, and more so if conditions warrant. We can also protect your teeth and gums with protective measures like antibacterial mouth rinses, saliva stimulation or high-potency fluoride applications for your enamel. What's most important, though, is what you can do for yourself to care for your mouth during the treatment period. Be sure to brush daily with a soft-bristle brush and fluoride toothpaste. You can use a weak solution of one-quarter teaspoon each of salt and baking soda to a quart of warm water to rinse your mouth and soothe any sores. And be sure to drink plenty of water to reduce dry mouth. While you're waging your battle against cancer, stay vigilant about your teeth and gums. Taking care of them will ensure that after you've won your war against this malignant foe your mouth will be healthy too.